The Social Progress Imperative has just launched its 2017 Social Progress Index with support from Deloitte and its strategic partners. Most of the countries from Central Europe are doing reasonably well and have achieved a high level of social progress. The 2017 Social Progress Index, and four years of results, tell us the world is generally improving, with 113 countries, out of the 128 countries ranked, showing progress. This is principally being driven by improvements in access to information, communications and advanced education driving social progress globally, with some convergence in progress towards nutrition and basic medical care, access to basic knowledge through enrollment and literacy, and water and sanitation. Most countries from Central Europe are doing reasonably well and have achieved a high level of social progress. Denmark is the world's top performer this year, closely followed by a combination of the remaining Nordic countries, as well as countries much larger in size and more diverse in population, including Canada, Netherlands, Australia, the United Kingdom, and Germany. Four years of results from the Index, tell us the world is generally improving, with 113 countries, out of the 128 countries ranked, showing progress. If the world were a country, it would rank between Indonesia and Botswana, with a population-weighted score of 64.85/100. That indicates an improvement in global social progress of 2.6%. The results are principally being driven by improvements in access to information, communications and advanced education driving social progress globally, with some convergence in progress towards nutrition and basic medical care, access to basic knowledge through enrollment and literacy, and water and sanitation. But progress is slow and uneven and reversing in some areas such as personal rights. At this rate of social progress the world is unlikely to meet the UN’s Sustainable Development Goals (SDGs) by 2030. Global social progress is improving. The world score on the Social Progress Index has increased from 63.19 in 2014 to 64.85 in 2017, and 113 out of the 128 ranked countries registered a positive change over that same period. Access to Information and Communications and Access to Advanced Education are driving this positive change. More and more lower-income countries are gaining widespread access to mobile phone coverage, increasing the number of subscriptions and converging with high-income countries where subscriptions are already high. Many countries are also improving in terms of the ability of their universities to join global rankings. However, global performance on Personal Rights has declined over time. On this Personal Rights, Personal Safety and Tolerance and Inclusion, there are especially wide disparities in performance between countries, with many countries both improving and declining. Components closely related to the Millennium Development Goals – Nutrition and Basic Medical Care, Water and Sanitation, and Access to Basic Knowledge – saw accelerated improvement in the past two decades. Since 2014, when data are widely available, that improvement has stagnated. Over the past four years, there has been slow change to these components. The Sustainable Development Goals (SDGs) are an ambitious global commitment to improve the wellbeing of the world’s citizens and ensure environmental sustainability by 2030. The SDGs are a commitment to the social progress agenda. We are actively supporting efforts to deliver on the promise of the SDGs. 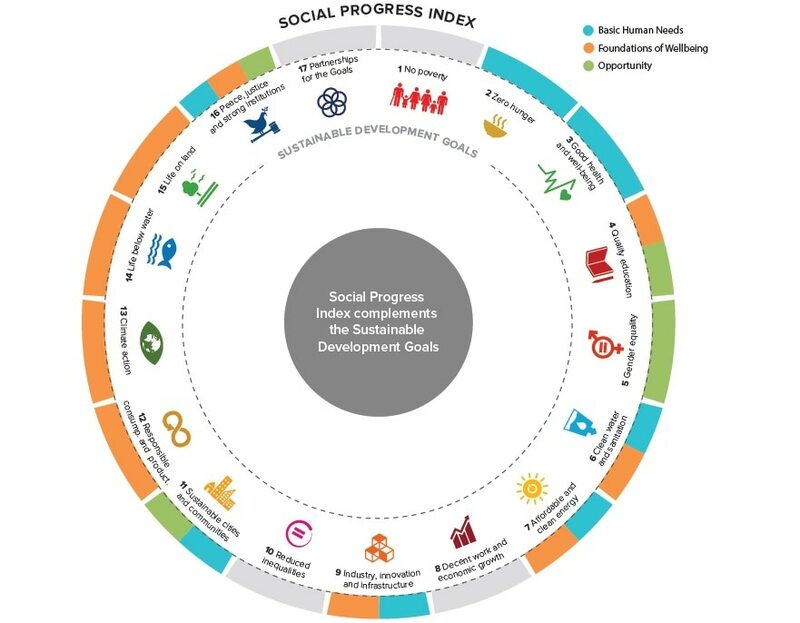 The Social Progress Index is a proven tool to measure social progress performance, and drive action. It can enable a rapid assessment to measure many of the SDGs, playing a complementary role to the United Nations (UN) monitoring systems that are being put in place.